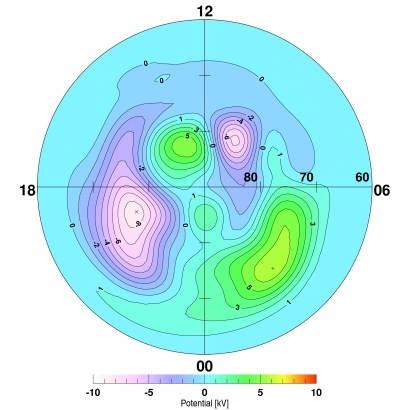 This potential map shows the plasma convection cells pattern in the Earth's ionosphere for northward directed interplanetary magnetic field (IMF). It is derived from a statistical study based on six years of Cluster EDI measurements. For northward IMF, the large scale average convection is weak. On the dayside (top half), two more cells appear at high magnetic latitudes (centred at ~83°) in addition to the characteristic two-cell pattern.